A $500m effort to train Syrian forces against the Islamic State has resulted in only a handful of fighters actively battling the jihadi army, the top military commander overseeing the war has testified. “We’re talking four or five,” General Lloyd Austin, commander of US Central Command, told a dissatisfied Senate armed services committee on Wednesday. The training initiative is Barack Obama’s linchpin for retaking Syrian territory from Isis. The Pentagon anticipated in late 2014 that it would have trained 5,000 anti-Isis Syrian rebels by now. “The program is much smaller than we hoped,” conceded the Pentagon’s policy chief, Christine Wormuth, saying there were between 100 and 120 fighters currently being trained. Wormuth said they were “getting terrific training”. Both Wormuth and Austin defended US strategy against Isis in the face of bipartisan skepticism from the senators. Senator Claire McCaskill, a Democrat from Missouri, mocked the Syrian training program, expressing incredulity that the Defense Department would seek another $600m to fund fighters she said the US was counting “on our fingers and toes”. “It’s time for a new plan,” McCaskill said. Austin, who insisted that “progress is being made” against Isis, said he “would not recommend” establishing a military cordon to protect Syrian civilians from forces loyal to dictator Bashar al-Assad and Isis, which has led to the flow of hundreds of thousands of desperate refugees currently causing a huge immigration crisis in Europe. 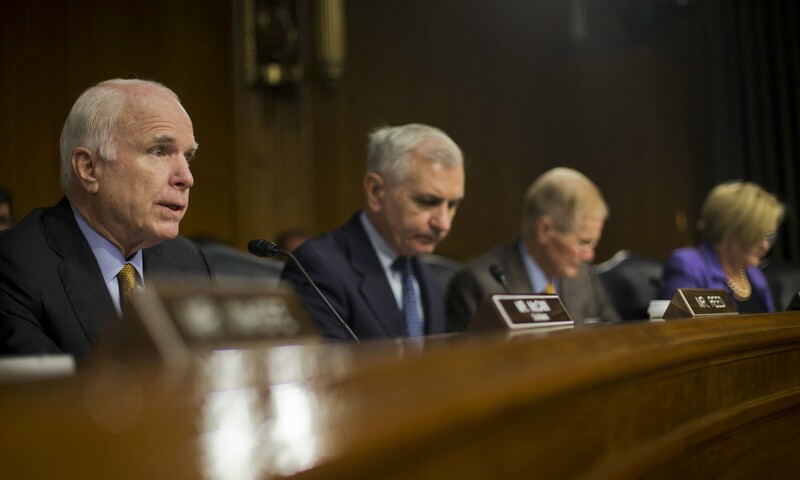 “I don’t see the force available being prepared to protect them currently,” Austin told an angry Senator John McCain, the Arizona Republican and former presidential candidate who chairs the panel. McCain called the administration’s strategy against Isis “a debacle”. Austin conceded that there was “slow movement at the tactical level” but defended the strategy he has overseen for a year. “There haven’t been any dramatic gains on either side,” Austin said, although earlier this year Isis seized the Iraqi city of Ramadi and the Syrian city of Palmyra. Austin is in the throes of a multi-pronged crisis within his command. Not only did Isis’s capture of Ramadi tear up his battle plan, which prioritized recapturing Mosul for the Iraqi government, his own intelligence analysts are furious at what they see as politicized pressure to portray the war as a success. The charge, from analysts at Central Command and those attached to it from the Defense Intelligence Agency, has sparked an inquiry from the Pentagon inspector general. Central to it is the command’s intelligence chief, Major General Steven Grove, whom analysts say oversees the suppression of assessments showing the war on a perilous trajectory. They are also alarmed by the unusual and frequent contact Grove has with the US director of national intelligence, James Clapper, first reported by the Guardian, which they see as contributing to an atmosphere of pressure. Clapper, in a weekend email obtained by Fox News, called the Guardian’s story “fictional BS”. Yet Clapper, who has apologized for misleading the Senate, confirmed and defended his contact with Grove, with its frequency being his only factual challenge to the Guardian’s story: the Guardian reported it as “nearly every day”; Clapper said it came “once or twice a week”. Former intelligence officials have told the Guardian the command climate inside Central Command is “toxic”. They have expressed bewilderment that Austin has not addressed it forcefully. Austin said “it would be premature and inappropriate” to discuss the investigation, but reiterated “you can be assured I will take the appropriate action”. He said he greatly valued his 1,200 “seasoned intelligence professionals”, and pledged publicly to “do everything within our power” to protect analysts he called “whistleblower”. Both Austin and Wormuth publicly affirmed that Russia is engaged in a military buildup in Syria, where embattled dictator Assad is a longtime Russian client. Yet Austin said Russia’s goals in Syria are unclear. “We really don’t know what their intentions are,” said Austin.